I remember a wonderful American woman who invited me to dinner in her home one night. After dinner I helped in the kitchen and she told me that she loved washing dishes. I was a teenager and frankly I did not believe her. I suspected she made it to encourage me to be optimistic about a chore that would be a big part of my life for the rest of my life. I thought she was making it up. Some years later, I read a story about a woman who had regained her sight after many years of blindness. 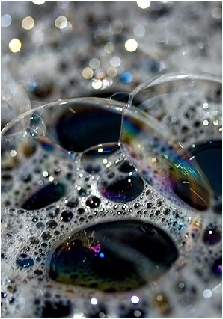 She became mesmerized by the shiny rainbow bubbles in the dishwater and described it in a way that made me wonder what I had been missing. I began to look more closely. I noticed the sparkling clearness of the water and how it churned a stripe of luminescent dishwashing liquid into iridescent bubbles. I began to take pride in a shiny glass and a spotless plate. I began to appreciate the ability to see, and to hear, and to enjoy all the little things that I often take for granted. And I became happier. Is there anything that you do every day that you are seeing from the wrong angle? Could you take more joy in cleaning your home? Many people don’t have a home to keep clean. Can you appreciate your children, even when they keep you up at night? Many people would love to have children but can’t. It pays to look at things from a different angle. I will probably never grow to love doing dishes, and there are so many more things I would rather do than clean house, but I do make an attempt to look for the bubbles and not the dirt in each chore.